Businesses, Councils, Schools, Organisations, Charities, etc. Standard golf tee on solid wood base (bases may vary from pictures). The Tee is manufactured in Hallmarked Sterling silver, 9ct gold or silver plated metal. Each item comes with a plaque that is engraved with details of your hole in 1. eg Golf club, hole number, club used yardage and date. Castle tee mounted on a solid wooden base (base may vary from shown picture). All items manufactured in Hallmarked Sterling slver, 9ct gold or silver plated metal. Each piece comes with a plaque that is engraved with details of your hole in 1. eg Golf club, hole number, club used yardage and date. Castle tee mounted on solid wood base with a club resting against the golf ball. Manufactured in Sterling silver & 9ct gold. Golf Ball Marker, manufactured in 9ct gold and sterling silver hallmarked on the back and presented in a leatherette box. Each piece can be personalised with your intials. Pitch Mark Repairer 60mm long. Produced in sterling silver and 9ct gold hallmarked and boxed. Sand Iron Tie Tac or stick pin Sterling silver or 9ct gold hallmarked . Presented in a leatherette box. Sand iron cufflinks in sterling silver or 9ct gold size of club 20mm. Hallmarked and presented in leatherette box. Cavity Back Iron stick pin or tie tac produced in Sterling silver or 9ct gold. Size of club 20mm. Presented in leatherette box. Cavity back cufflinks produced in Sterling Silver and 9ct gold. Club 20mm all items hallmarked and presented in leatherette box. Golfer stick pin & tie tacs manufactured in 9ct gold & sterling silver. Size 20mm approx. Hallmarked and presented in leatherette box. Bag of Clubs penadant manufactured in 9ct gold & Sterling silver. Size 25mm. Hallmarked & presented in leatherette box. Golf bag key ring manufactured in sterling silver & 9ct gold with safety roller catch fitting and chain. Hallmarked and boxed. Golf tee key ring manufactured in Sterling silver & 9ct gold. Key ring has roller catch safty fitting & chain. Hallmarked and presented in leatherette box. Hand crafted bag of golf clubs resting against the fence, each club is individually made and can be removed form the bag for better effect. Mounted on large wooden base. All items manufacture in Sterling silver and 9ct gold. 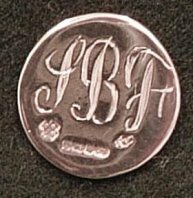 All items are hallmarked. Bag of clubs cufflinks manufactured in Sterling silver & 9ct gold. All items hallmarked and presented in a leatherette box. Approx size 22mm. Hand crafted pewter Claret Jug, classic design. Available in 3 sizes 15", 11" and 8".